If you've yet to take a trip down to the Mornington Peninsula, to visit The Enchanted Adventure Garden, what are you waiting for? We drove out to the edge of the Mornington Peninsula to The Enchanted Adventure Gardens a few weeks back. The drive there was spectacular! The route from Melbourne took us to the top of Arthurs Seat State Park, the ocean views were magnificent; a scene we just hadn’t banked on, having not looked at the route we were taking. Thanks Sat Nav! We managed to convince Monty he was too young to join in with the Tree Surfing although they do offer a Nippers version for the little ones. We decided to make the most of everything else that was on offer, which was a lot, and save the tree surfing for birthday fun in April. We spent a magical day playing games, walking through the trees, and creeping along the canopy walkways (because you’re not allowed to run! Tell that to the tourists!). 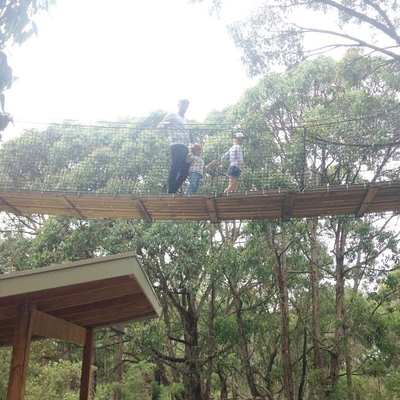 We did the ‘Bush Adventure Scramble’ which was a fab obstacle course for the kids, nestled in amongst the giant trees of the Arthurs Seat Forest. I spent most of the time doubled up, laughing hysterically as the children got stuck on various rope nets, tangled up in the stretchy strings or plopped off the wobble board into the mud! Screams of “heeeeelp Muuuum” were met with silent laugher as I crossed my legs, terrified I may have my own little accident. There really is no end to the fun to be had at the Enchanted Gardens! We made our way down the ‘sculpture walk’ past the beautifully carved life like figures, to the Tube Slides and settled there for a while. 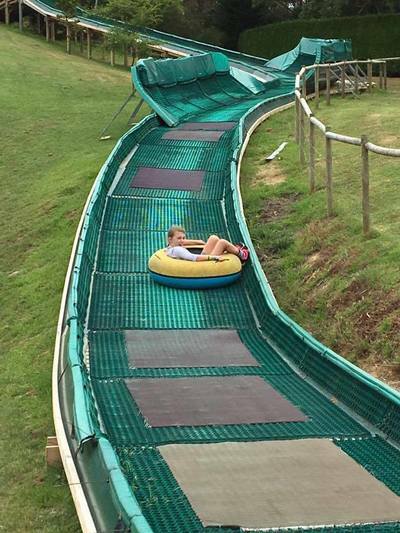 The rings are huge inflatable tyres, which need to be dragged up the hill before you can slide all the way back down again, whilst being sprayed with water! The children insisted I had a go; the delightful chap at the top pushed me full pelt off the ledge! It was then, as I was careering backwards downhill I decided that this wasn’t really my thing! I like to be able to see where I’m going especially at speeds of about 40kms an hour. Not only that but when I’m sent hurtling backwards downhill, being hosed with a fine spray, my hair takes a turn for the worse. I arrived at the bottom to gasps from small children, clutching onto their parents as Chewbacca’s wife prized herself out of a tiny tyre. Not a pretty sight I can assure you! Once I regained the use of my legs, and the children had become tired of dragging their tyres up the hill (they weighed a ton), we headed for the 10ft tall conifers that make up the main Maze. Once they had nailed that, they were back by my side begging to go to the Lolly Shop, I punched the air, and whimpered a little “Yay! !” The lolly shop is like a candy cave, full of all the lollies you never usually let your children eat... There was no getting away with a little handful, as you have to buy a cup and fill it up! So, we filled them full of sugar, then hopped back into the car. You can only imagine what our journey home was like. Thank you ‘Enchanted Adventure Garden’ for a wonderful, great value for money, family day out.